For a casually elegant getup, consider pairing a BB Dakota its all happening faux fur coat from Nordstrom with black leather skinny pants — these items go perfectly well together. Black suede pumps are a nice choice to round off the look. If you're scouting for a casual yet totally chic outfit, team a BB Dakota its all happening faux fur coat with a hot pink mini skirt. Both items are totally comfy and will look fabulous paired together. Finish off this ensemble with black leather heeled sandals. If you're after a casual yet totally stylish getup, make a BB Dakota its all happening faux fur coat and a black leather mini skirt your outfit choice. Both pieces are totally comfy and will look fabulous paired together. When it comes to footwear, this ensemble is finished off nicely with black leather knee high boots. For a nothing less than drool-worthy outfit, go for a BB Dakota its all happening faux fur coat and black dress pants. Finish off this outfit with black leather heeled sandals. For a casually elegant ensemble, consider wearing a BB Dakota its all happening faux fur coat and black leather skinny pants — these pieces the place of work pretty good together. When it comes to footwear, this look is finished off wonderfully with black suede pumps. For a casually elegant ensemble, choose a BB Dakota its all happening faux fur coat and blue jeans — these items the workplace pretty good together. When it comes to shoes, this look is round off wonderfully with black leather pumps. If you're on the lookout for a casual yet totally stylish ensemble, consider wearing a BB Dakota its all happening faux fur coat and black culottes. Both items are totally comfy and will look fabulous paired together. Rock a pair of black and white athletic shoes for a more relaxed feel. 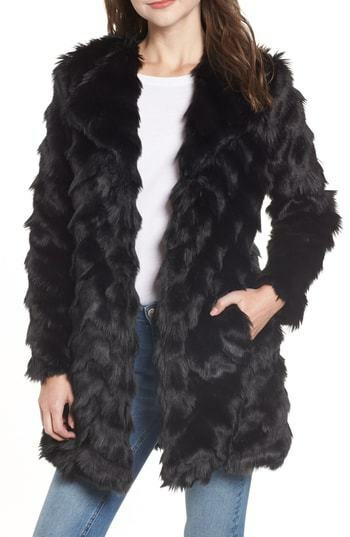 For a nothing less than drool-worthy look, dress in a black fur coat. For something more on the daring side to round off this outfit, throw in a pair of black leather knee high boots. For a casually elegant getup, go for a BB Dakota its all happening faux fur coat and light blue jeans — these two pieces play perfectly well together. When it comes to shoes, this ensemble is finished off perfectly with black cutout suede ankle boots.